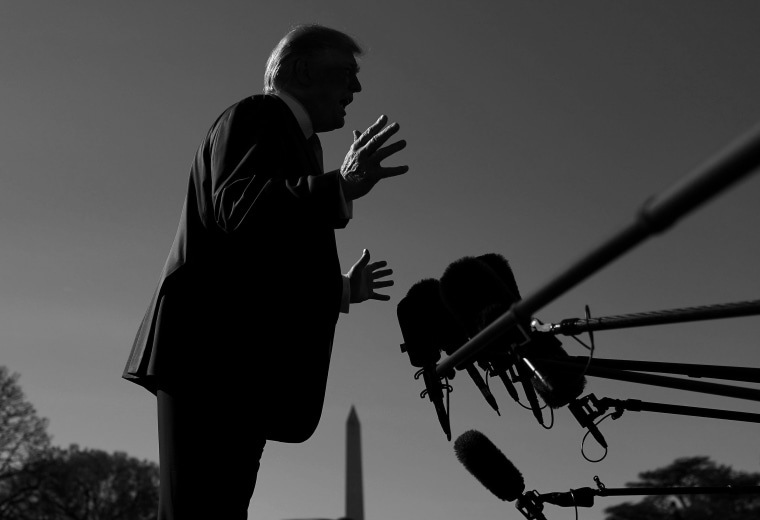 Analysis: As a newly emboldened president takes action, the left and the right both see the president they've always thought was there. In recent weeks, Trump has thumbed his nose at Congress to try to build a border wall, purged the Department of Homeland Security to get a harder-line position on immigration, withdrawn legal objections to gutting Obamacare benefits, moved to dismantle a major federal agency and successfully pressured the Department of Justice to investigate perceived political enemies he said Wednesday are guilty of "treason" for having pursued a probe of his campaign's ties to Russia. It's as if someone hit the play button on a domineering presidency that had been paused by special counsel Robert Mueller's investigation, a five-week government shutdown and the various distractions created by the president himself. There's nothing wrong with Trump using the powers granted to him by the Constitution or Congress' cession of authority to the executive, Rachel Bovard, policy director at the Conservative Policy Institute, said. "We’re seeing the logical conclusion of Congress giving the executive branch a lot of power," she said in a phone conversation with NBC News during a break from training to get her concealed-carry permit in the District of Columbia. "Congress has plenty of authority to take their authority back and they haven’t. ... They stomp their feet and scream about a tyrant." Conservatives thought President Barack Obama abused his powers, including when he created the Deferred Action for Childhood Arrivals program, which protected certain immigrants who were brought to the country as children from deportation. And they believed, as many liberals do now, that the president's party in Congress was far too willing to let the executive run roughshod over the legislative branch. In 2016, Trump's rival, Hillary Clinton, promised to use executive authority to address a series of hot-button issues, including her proposal to end the so-called gun-show loophole, which cheered liberals who were frustrated by Congress' ability to thwart parts of Obama's agenda. That's not to say every action is equal in moral value or proportion. But the move of party taking precedence over institutional prerogative is part of a long-term trend that activists on the right and the left have seen as a means of enacting their favored policies. That trend has combined with Trump's penchant for dramatic demonstrations of power to leave little question that he's testing the limits of what a president can do unilaterally. Several states have sued him over his decision to take money appropriated for military construction projects — and from other accounts — and use it to build a wall that Congress denied funding for before voting to block his plan. Trump vetoed the latter bill and will force the courts to decide whether he's within his constitutional rights. "There’s legitimate use of legitimate power. There’s abuse of legitimate power. And then, there’s creating illegitimate powers than no one ever intended to give you," he said, pointing to Trump's decision to use funds appropriated for other purposes to build a border wall as illegitimate, and his decision to withdraw the government's objection to a lawsuit against Obamacare as a legitimate, but misguided, use of power. "What I think progressives think about is 'what is a legitimate use of legitimate power?'" he said. "Things like environmental protection and civil rights protection and busting up anti-competitive monopolies are powers that go unused. Those were legitimate powers that have gone unused by the Bush and the Trump administrations and that progressives would want to utilize if we take back the White House." But there's a different kind of fight over what Trump depicts as an effort to use the power of the government to correct for what he sees as an abuse of federal authority against him. Rather than a question of policy, it's a matter of politics and law that leaves no room for the possibility that it was legitimate both to investigate the Trump operation's ties to Russia and questions about the obstruction of justice, and for Mueller to find no evidence of a conspiracy with Russia. From the South Lawn of the White House, the seat of executive power, Trump told reporters Wednesday that former government officials involved in starting and pursuing the investigation into his campaign were guilty of "treason" — a crime punishable by death — at nearly the same time Attorney General William Barr was telling Congress he believes the Obama administration spied on Trump's campaign. Barr provided no evidence. No one has been charged with a crime. No jury has rendered a verdict. But the president and the nation's top law enforcement officer, speaking separately and yet in conjunction with each other, began to lay out a public case that American citizens are guilty. "It was an illegal investigation," Trump said. "Everything about it was crooked. ... There were dirty cops. These were bad people. ... And this was a — an attempted coup. This was an attempted takedown of a president. And we beat them." A few moments later, Trump dropped the "T" word. "What they did was treason," he said. "What they did was against our Constitution and everything we stand for." Under federal law, a person has to wage war against the United States or provide aid or comfort to the nation's enemies to be found guilty of treason. "While there is a debate about how effective he is or whether its bold versus tyrannical, his rhetoric should be a cause for concern," Julian Zelizer, a professor of history and public affairs at Princeton University, said in an email. "His ongoing accusations about top law enforcement officials and his claims that they are guilty of things like treason goes beyond what any liberal or conservative should accept." Zelizer noted that Trump's allegations are made without producing evidence and that he uses the standing of his office to put them into the public discussion. "This is dangerous stuff and a fundamental misuse of the office," Zelizer said. "Not only can they harm individuals, but they undercut trust for major institutions. It should be treated as seriously as other forms of abusive executive power. It is difficult for Congress to know what to do about it, since it is rhetorical, so much of the weight for pushing back falls on his own party taking tough steps when he says things like this. Until now, they have only supported him." Whichever interpretation they embrace, there's clearly a commonality in the way the left and the right view Trump, Zelizer said: "Both sides agree this is a very imperial president — at least, he tries to be."